I needed to make another trip to the supermarket to restore our badly depleted larder, and the map advised me that the nearest bridge is B64. Not by much, but if you’re carrying 40lbs of groceries every yard counts! But first we had to top up with water. The sanitary station is just through the next bridge from the mooring, and we were filling up when Bruce and Sheila went past on NB Sanity. 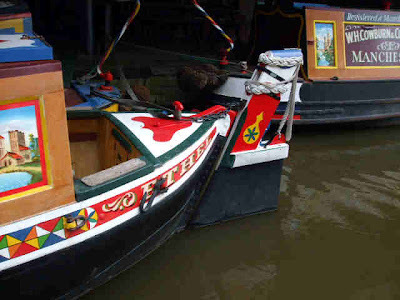 Shouted greetings, and they went on to moor on the town moorings for shopping. We passed them, moving on to moor a little precariously near Bridge 64. We ran aground about 6” from the bank, so I hopped off and hammered in mooring pins as we were. It wouldn’t have done for any length of time, but was adequate for an hour or so, especially as Mags was staying on board. 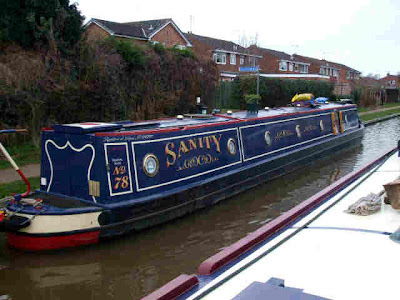 Passing NB Sanity on the town moorings. 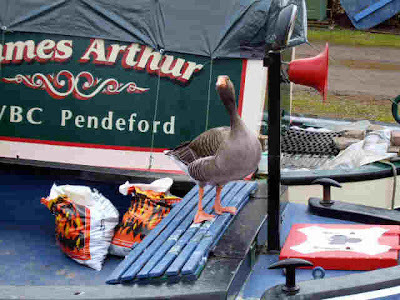 We had a very gentle cruise towards Adderley Locks, barely above tickover listening to the birds. I jumped off with Meg between bridges to stretch our 6 legs. We intended to moor just above the flight, but that damn concrete shelf below the water prevented us from getting any closer to the bank than about 10”. So took the decision to work down the flight, and moor at the bottom where we moored 18 months ago. 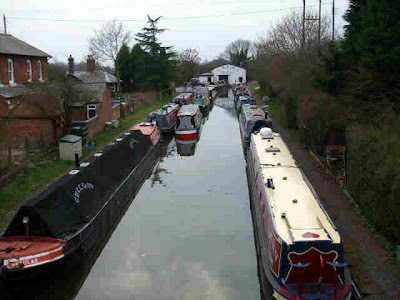 Like Tyrley, Adderley Locks are a joy to work, light gates and well oiled gearing. In fact I congratulated a chap from BW this morning while I was out with Meg. 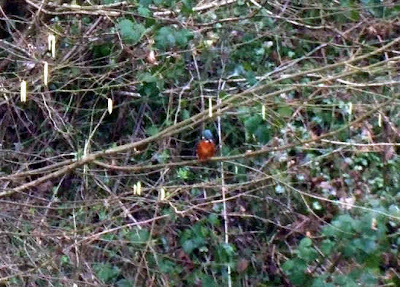 He was out with his oil can and grease gun at Tyrley. 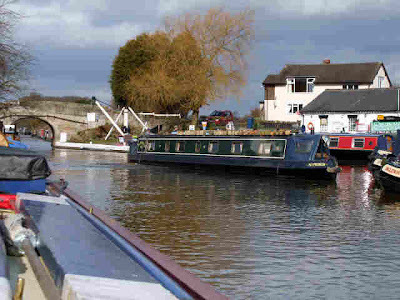 We moored at the bottom of the locks. As it turned out I’m glad we couldn’t get in at the top, it’s a lot more pleasant down here. We had a day off yesterday. Well. I’m saying a day off…. 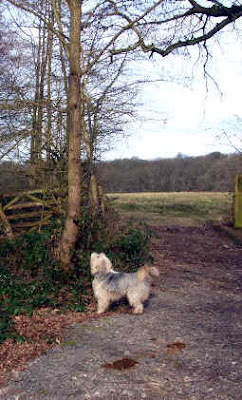 I relined and blacked the stove, fitted a new seal on one of the loo tanks, sawed and chopped enough wood to last us for a few days, took Meg for a couple of long walks…..
Today we were away a bit earlier than normal, pulling pins at 09:35. 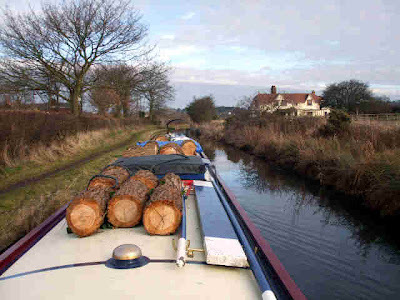 There is about a mile of moorings on the offside near High Offley. 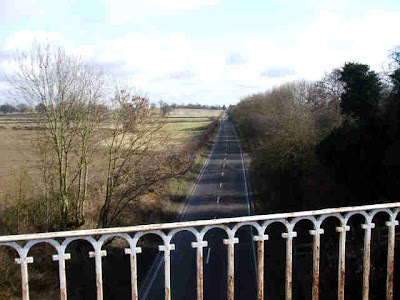 Shebdon is another high embankment running clear over the farmland for a just less than a mile. 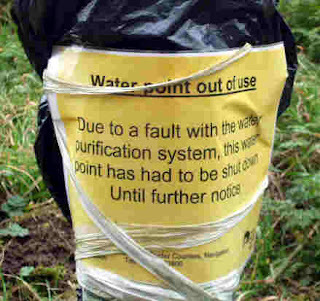 A couple of years ago BW undertook a major project to stop leaks from the channel. Looks like it’s still ongoing. 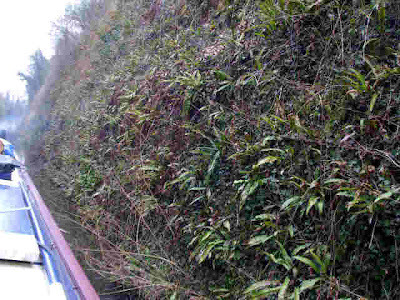 The embankment ends at Knighton. The factory there on the canal used to belong to Cadburys, and produced chocolate crumb using local milk and not so local cocoa beans delivered by canal. This would then be shipped to the main factory at Bournville in Birmingham. It’s still in production, but now making milk powder. The loading canopy is still home to several ex working boats. 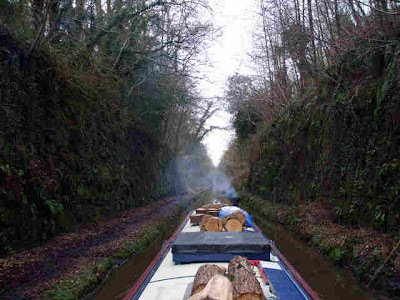 After Knighton, 3½ miles of wooded sections and long distance views gives way to the damp, gloomy confines of Woodseaves Cutting. From Bridge 55 to 58 the canal follows the canyon cut through the rock, sometimes 50 feet deep. 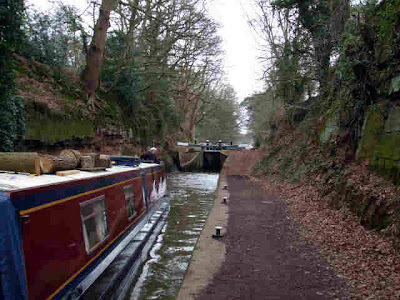 Popping out into the open again, it’s only a short stretch to the top of the Tyrley flight of 5 locks. If you’ve got to do a flight of locks, you can’t do much better than these. finally exiting in a rocky cut. 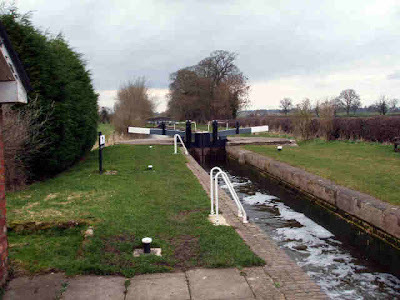 The gear is well maintained, the locks are just a comfortable distance apart, and the towpath is generally good. It just turns a bit grotty below the last lock. There are services at the top, opposite the wharf, but the drinking water is turned off. There’s a fault with the purification plant. The temporary looking notice on the pedestal is still looking good after at least 18 months! It was there when we last came this way, in October 2007! Good job there’s water available at Market Drayton and Norbury. 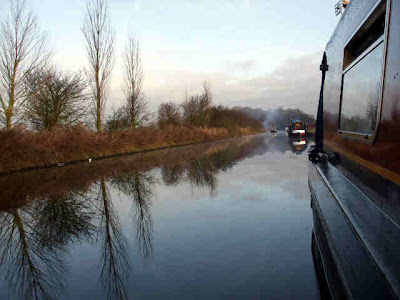 Another mile saw us pulling on to the visitor moorings just before Bridge 62. This is where we got our first surprise. The boat we pulled in front of looked familiar; it should have done, it was Chas and Ann on Moore 2 Life! We expected them to be well ahead of us by now, and in fact they moved on shortly after we arrived, having just done some last-minute shopping. After seeing them off, I toddled off up to Morrisons myself. It was when I got back I got the second surprise. Sarah off Greygal was sitting having a cup of tea with Mags! Their boat was still on it’s mooring in the marina, but she’d decided to have the afternoon off and come looking for some fellow bloggers. We had an enjoyable hour or so, just chatting, before she set off to look for someone else, I think Brian on NB Sanity. Then she’ll try to find Moore 2 Life and No Problem. A most enjoyable day all round. 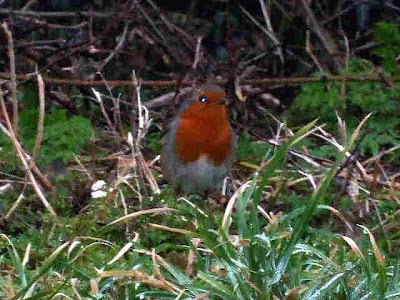 A bit grey first thing but by mid-morning the sun had come out, the birds were singing, and I was out walking with Meg. 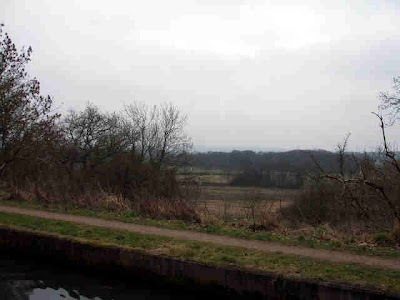 There’s a bridleway that runs for a few couple of miles to the east of the canal, making for a couple of enjoyable circular walks. We went north yesterday afternoon, to High Bridge and back. 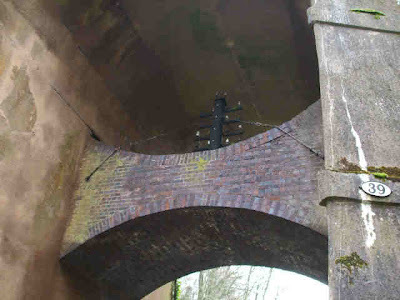 One of the iconic images of the Shropshire Union is High Bridge, with a masonry strut across the span, mounting a telegraph pole. A slightly different shot, taken from the towpath. The remains of the Newport Branch, which used to drop through 17 locks to the town. 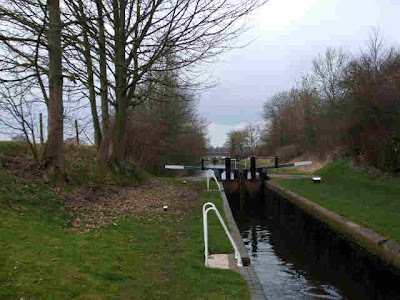 It closed in 1944, and only the stub to the top lock, now used for moorings, is in water. 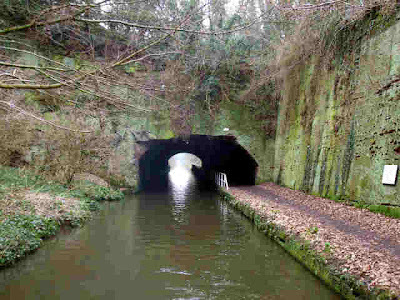 Today it was south from Norbury, along the towpath to the end of the embankment, then back along the bridleway. Minor roads pierce the embankment in 2 places. Incidentally, I learned a bit more about Shelmore Embankment last night. It appears that it needn’t have been built at all, if the local gentry had been more co-operative. Lord Anson, of Norbury Park, refused permission for the canal to cross his estate, fearing that it would upset the shooting. I’m guessing that Telford’s original survey didn’t take this obstacle into account, as the straight route from Bridge 37 to Bridge 38 would have been pretty much smack on the 325 foot contour, the same as the rest of this stretch. A 19c NIMBY (Not In My Back Yard), then! We moved down to the wharf for the services this morning and spotted a boat coming through the bridge towards us. We were surprised to see that it was Sue and Vic on No Problem. We knew they were ahead of us, and expected them to stay there! They’ve decided to have the boat’s saloon refitted, and came back to Norbury for measuring up and confirming dates. So we had the opportunity to catch up with the gossip. The dogs couldn’t, however, as Sue’s Meg and Lucy are still officially in quarantine after getting a bout of kennel cough at Christmas. Apparently it takes 3 months before risk of infection has passed. Our Meg was well frustrated at not being able to have a chase around with NP Meg! 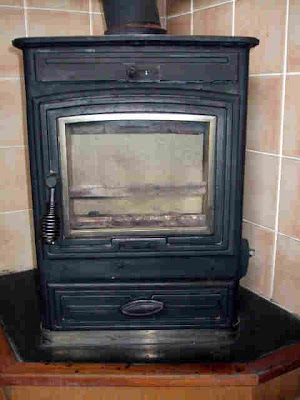 I made a visit to the chandler, mainly for a fire brick set for the stove (the rear liner has cracked), but finished up with a few odds and ends as well. 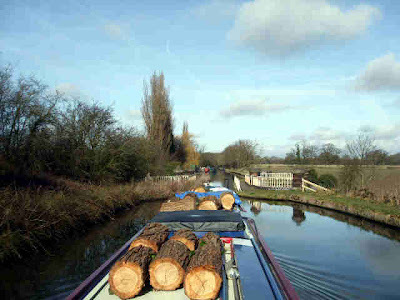 Then we set off, in convoy, heading north up the canal. 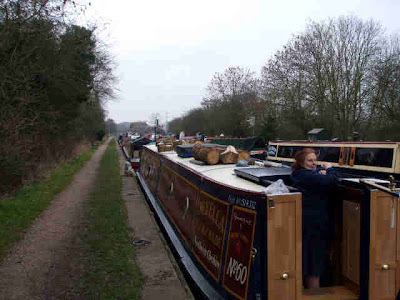 We only went a couple of miles, pulling over at Anchor Bridge, while Sue and Vic pushed on to Tyrley. 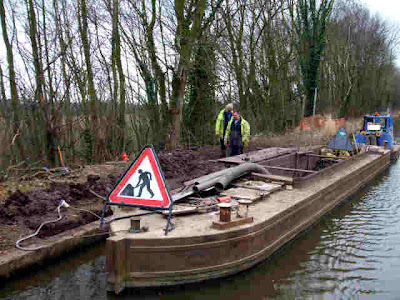 We both heading for the same place, Ellesmere Port, but, while we don’t need to be there before the end of March, they need to be back at Norbury for the refit before then. So we’ll not see them again till they’re on the way back down again. A long weekend off, then a longer than planned cruise. We stayed near Little Onn till today. 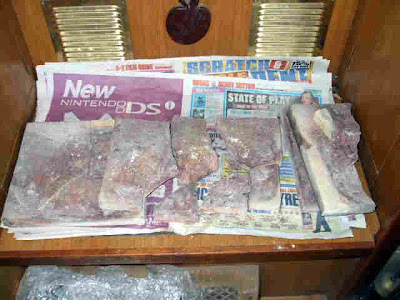 I fitted a new chain (collected with the mail) to the saw, and made short work of slicing up some of our log collection. Meg and I had some good long walks, I had some good hard runs on the local minor roads, and Moore 2 Life arrived from Wheaton Aston and stayed till yesterday. Chas and Ann came aboard and we caught up with the news. At one time we had 6 boats on this popular spot, but by this morning all but ourselves and the chap on NB Sparrowhawk had moved on. We left him on his own at around 11:30 this morning. 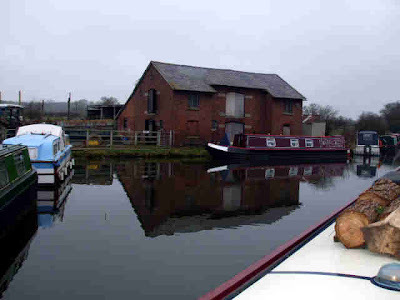 Had a very gentle cruise to Gnosall, past High Onn Wharf and to bridge 25, where the towpath swaps sides. 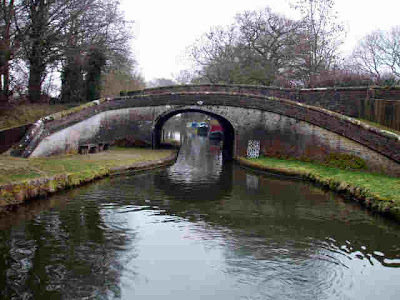 Up to this point there’s about a ½ mile of permanent moorings on the offside, and the sign on the bridge asked boaters to slow down as they are going “passed”…..
Cowley Tunnel comes soon after, entered at the end of a long, damp cutting. 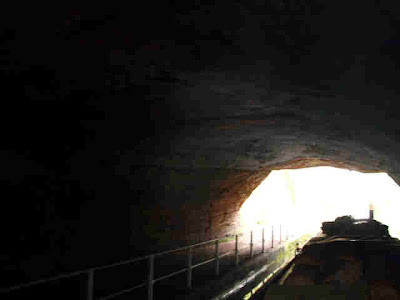 Apparently, this cutting was supposed to be part of a 690 yard long tunnel, but instability in the rock led to it being opened out, leaving a short 81 yard length. 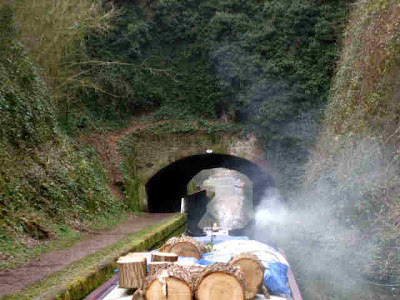 Probably not a good idea to put a couple of logs on the fire just before the tunnel…. In the tunnel – cough! Fresh air at the northern end. Gnosall visitor moorings were pretty busy, but we weren’t intending to stop here, just through the village and out into the country would do. But the plan went awry as I couldn’t get the boat into the bank, though I tried in a few places before we hit Shelmore Embankment. This structure proved to be a major headache for the engineers, as time and again the slopes collapsed. It was the last link in the navigation to be completed, taking nearly 6 years and millions of tons of earth and rock to be shifted from Woodseaves Cutting, a few miles to the north. About a mile in length, it stands up to 60 feet above the surrounding farmland. The sides are now wooded, affording only brief glimpses of the view to the west, but helping to stabilise the steep slopes. 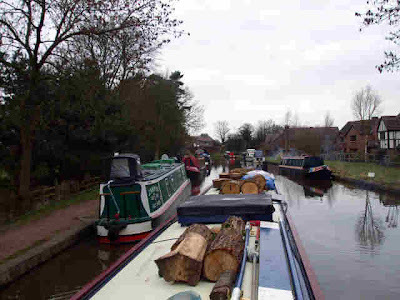 We ended the day moored on the visitor moorings just south of Norbury Junction. 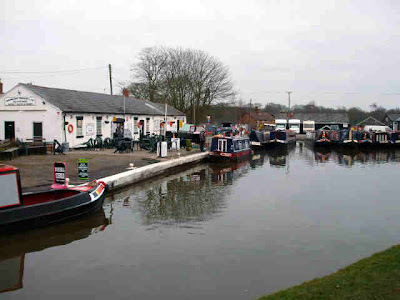 Not our usual sort of spot, busy with boats fore and aft, and permanent moorings opposite. But I’ve got to make a visit to the chandlers tomorrow. Then we’ll shove off for points further north. It’s not been a bad day, starting drizzly but drying up by mid-morning. Quite mild too, and the wind we’ve had over the last couple of days has dropped. Them Romans certainly could build roads… Watling Street The original route runs from Dover to Kenchester, near Hereford on the Welsh border, via London. A distance of 276 miles. 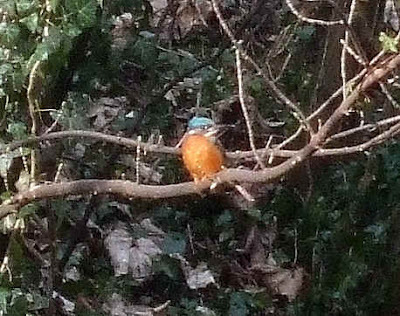 And we have the temerity to call it the "A5"
Kingfisher dozing in the sun. A bit fuzzy. I got the Mbyte setting wrong. Waiting for the tank to fill, and enjoying the sunshine. Then under the bridge onto Turner’s wharf for diesel and a gas bottle. Still 51.9p for a litre of the red stuff. 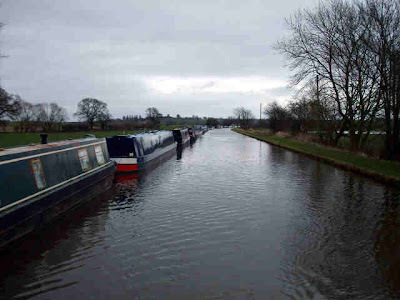 And finally across to the visitor moorings so I could make a trip up into the village. Mail collection at the Post Office, and a few groceries from the Spar shop. 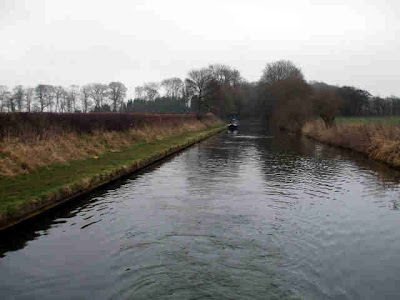 In common with Brewood, the towpath alongside the moorings in the village is a bit grim, so we’d already decided to push on out into the countryside to stop. 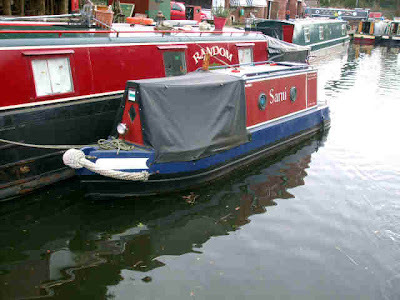 It was only as we were moving out I realised we’d been moored just a few yards from Chas and Ann on Moore 2 Life! Chas was waving out of the window. I hope he didn’t think we were ignoring them. Sign language between us told me that they were turning round and heading north again, maybe tomorrow. So we’ll probably see them over the weekend. 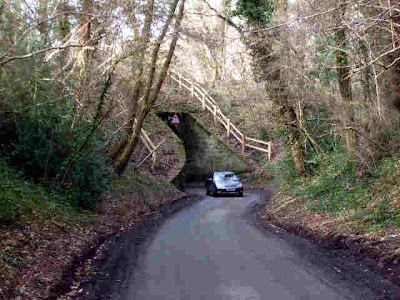 We moved on a couple of miles to Little Onn Bridge, pulling over just clear of Rye Hill Cutting. It’s a pleasant spot here, with good TV. The farm opposite is a little aromatic at times, though. Good country air! We’ve been joined by Ted and Jenny on NB Conway. 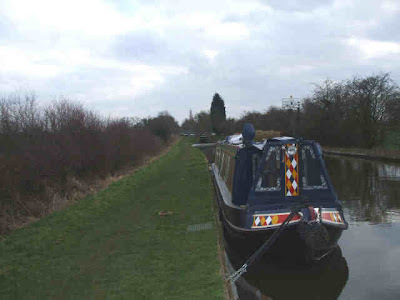 Had a chat, found out that this is their favoured mooring on this stretch. 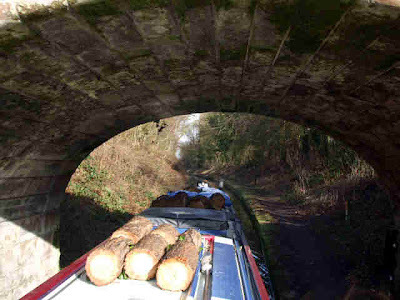 And that the tree cutters are busy at Gnosall, with plenty of wood available for the taking. They can’t see over the stack on their roof! 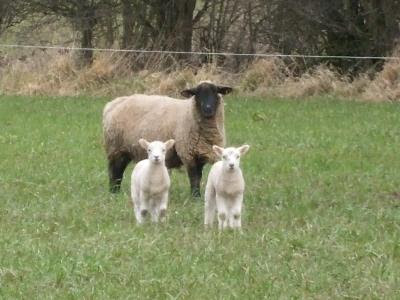 I meant to give my views on the southern half of the Staffs and Worcs yesterday, but got distracted. So here they are today, for what they're worth. If you're in the area and have a few days to spare, head off to Stourport on Severn. Even if you've no intention of dropping down onto the river, it's well worth the visit. Even though the sections through Wolverhampton and Kidderminster are not that inspiring, the countryside in between is well worth seeing. The villages of Kinver and Wolverley are a delight. 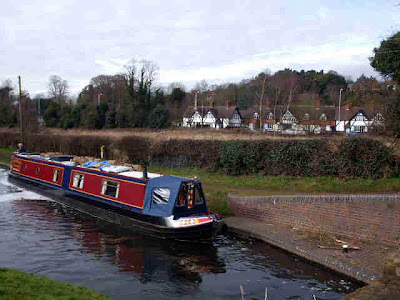 And the climax, the basins at Stourport, are an impressive and interesting destination. 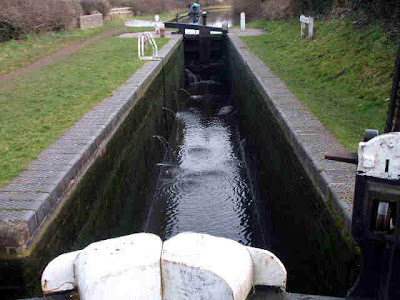 The locks are mostly in good condition, with a few leaky gates but nothing serious. Bratch is an interesting flight to work down and up, and you get a sense of history here and at the junctions with the BCN. So there you have it. Go and have a look. 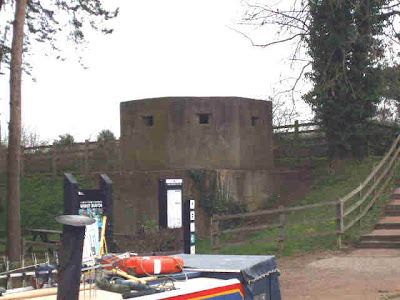 And if you're doing the Stourport Ring, don't just dash through, take your time and have a look around. I thought we were in for a wet day today. It was raining at 10 past 7 when I got up, but had stopped by half past. The sky started to clear, and there were warm sunny spells by the time we got underway at 10:30. 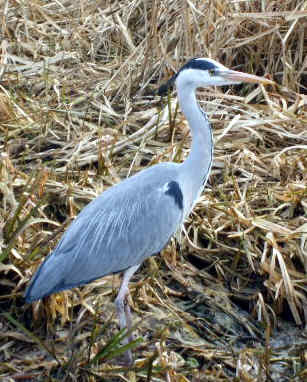 Heron enjoying the sunshine A boater with a valid point to make, and the courage to make it! 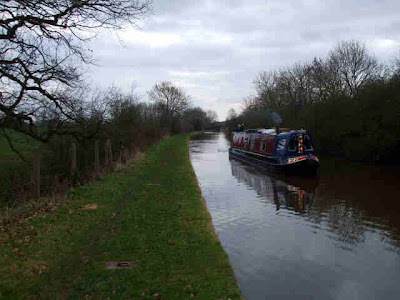 We had a steady cruise up the remainder of the Staffs and Worcs to Autherley. 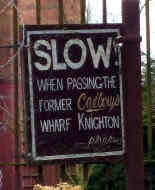 All the locks were against us, as we were following a couple on NB Inglewood, heading back to Norbury. 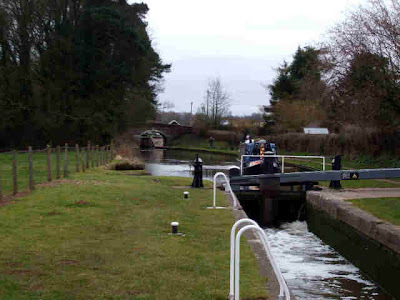 But it was no problem, the locks fill and empty quite quickly and we were in no hurry. Waiting for Wightwick Lock, with mock-Tudor des-reses in the background. 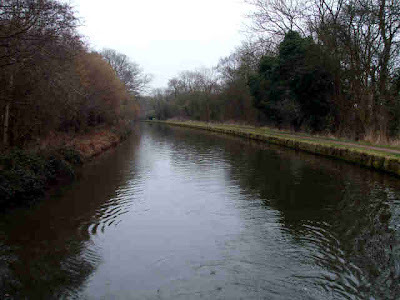 Wightwick Mill Lock – Free boat wash! We were disappointed to have missed Kev on NB 4Evermore at Compton. He was there yesterday, having some work done on a cover, but left for Coven Heath first thing this morning. He left a comment on yesterday’s post saying to look out for him. 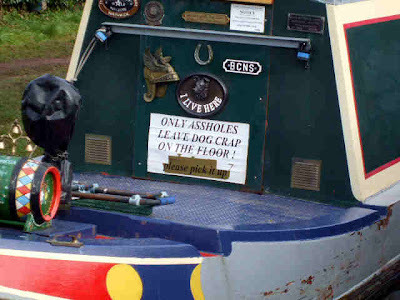 At Oxley Marine there’s an unusual narrow narrowboat. All of about 18 feet long as well! NB Sarni. She's even got a scaled down bow fender! 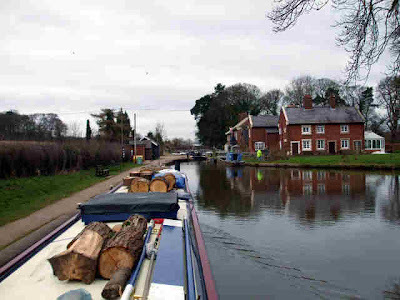 We turned onto the Shropshire Union at Autherley Junction, through the stop lock and past Napton Narrowboats hire base. A lot of boats laid up for the off-season here. 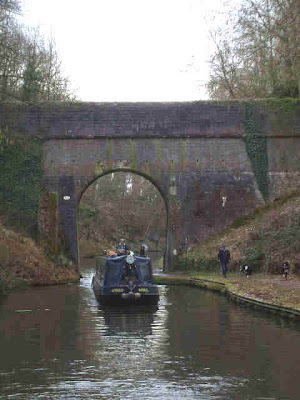 A short distance up the canal is the Wolverhampton Boat Club. This is where we spotted the Security Goose near the end of January, and Sue on No Problem spied him in the same spot a couple of weeks ago. Yes… Can I help you?…. 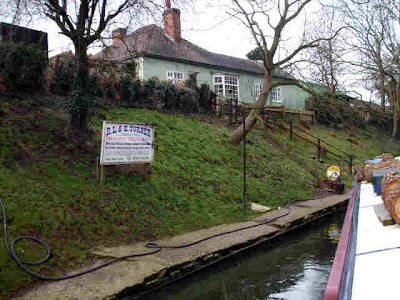 We moored where we’ve stopped before, between Bridges 7 and 8, about 3 miles from the junction. Last time we were the only boat here for 2 days. Today we’re merely a quarter of the population. While I was out with Meg this morning we walked past John Jackson’s boat on it’s mooring. 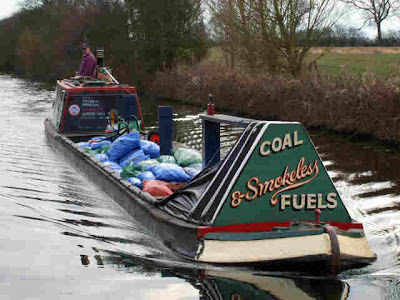 It was being loaded with coal for a trip up to the River Weaver. I expected them to be passing us at some point today, and was not disappointed. Working boats always look great when they’re loaded as they should be. 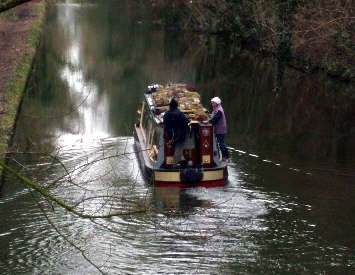 Trouble is, on a lot of canals these days “the bottom is too near the top”, and a boat with more than 3 feet draught can be a handful! 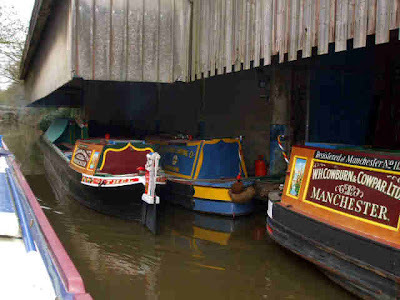 UK Only Waterways Sites Ranking by Tony Blews! 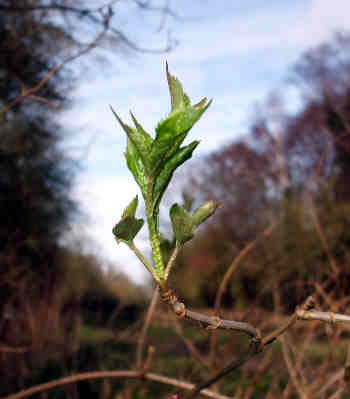 A touch of Spring in the air.. The snow turns to rain, the towpaths turn to mud. A climb at Kinver but well worthwhile. Another fine day, and full cupboards again. More wood, then the landscape turns white! Now that the rush has gone! Hello Peter how are you? 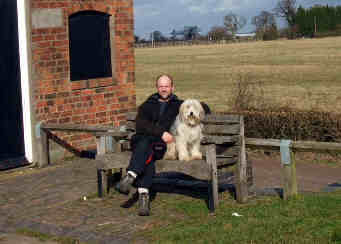 Newark to Holme Lock, 21.7 miles 5 locks.